Offer An incentive in direct marketing or a product offering. Offline promotion See Promotion (online and offline). Offline web metric Offline measures are those that are collated by marketing staff recording particular marketing outcomes such as an enquiry or a sale. They are usually collated manually, but could be collated automatically. One-to-one marketing A unique dialogue that occurs directly between a company and individual customers (or less strictly with groups of customers with similar needs). The dialogue involves a company in listening to customer needs and responding with services to meet these needs. Online brand See Digital brand. Online branding How online channels are used to support brands that, in essence, are the sum of the characteristics of a product or service as perceived by a user. Online customer experience The combination of rational and emotional factors of using a company's online services that influences customers' perceptions of a brand online. Online incentive schemes See Loyalty techniques. Online intermediary sites Web sites that facilitate exchanges between consumer and business suppliers. Online promotion See Promotion (online and offline). Online promotion contribution An assessment of the proportion of customers (new or retained) who are reached by online communications and are influenced as a result. Online revenue contribution An assessment of the direct contribution of the Internet or other digital media to sales, usually expressed as a percentage of overall sales revenue. Online services providers (OSPs) An OSP is sometimes used to distinguish large Internet service providers (ISPs) from other access providers. In the UK, AOL, Freeserve, VirginNet and LineOne can be considered OSPs since they have a large amount of specially developed content available to their subscribers. Note that this term is not used as frequently as ISP, and the distinction between ISPs and OSPs is a blurred one since all OSPs are also ISPs and the distinction only occurs according to the amount of premium content (only available to customers) offered as part of the service. Online service-quality gap The mismatch between what is expected and delivered by an online presence. Online value proposition (OVP) A statement of the benefits of e-commerce services that ideally should not be available in competitor offerings or offline offerings. Online web metrics Online measures are those that are collected automatically on the web server, often in a server log file. Operational effectiveness Performing similar activities better than rivals. This includes efficiency of processes. Opt-in A customer proactively agrees to receive further information. Opt-in e-mail The customer is only contacted when he or she has explicitly asked for information to be sent (usually when filling in an on-screen form). Opt-out e-mail The customer is not contacted subsequently if he or she has explicitly stated that he or she does not want to be contacted in future. Opt-out or unsubscribe options are usually available within the e-mail itself. Outbound e-mail E-mail sent from a company. 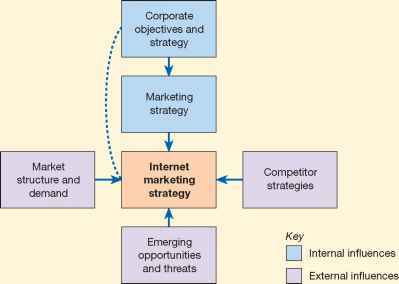 Outbound Internet-based communications The web site and e-mail marketing are used to send personalised communications to customers. Outsourcing Contracting an outside company to undertake part of the Internet marketing activities. Overt Typically an animated ad that moves around the page and is superimposed on the web site content.